After a rather long hiatus, I am continuing my series of Iconic Icons. Since Advent (and thus a new Liturgical Year) began today, and since this season prepares us to celebrate the Incarnation of Christ (among other things), and since the Incarnation is the doctrinal basis of iconography, I decided it is an appropriate time to revive my series. 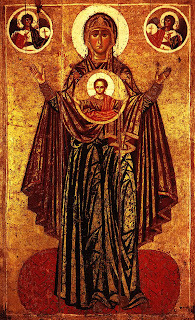 Following the post on the Pantocrator, a post on a popular icon of Christ, I decided to write a post on the second most important and popular category of icons: the icons of the Theotokos (θεοτοκος). Hodigitria (Οδηγητρια), the Guide: Mary is holding the Christ Child and is pointing toward Him, He Who is the source of salvation, and thus Mary is acting as a Guide leading us to our salvation. Eleusa (Ελευσα), Tender Mercy: Mary is holding the Christ Child, and He touches His face to hers while wrapping at least one arm around her neck and shoulder. 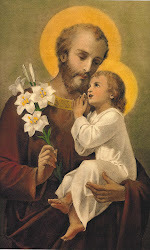 It is often used to represent the relationship between God (Christ) and the Church (Mary). Panakranta (Πανακραντα), All Merciful: Mary is enthroned with the Christ Child on her lap; both are facing the viewer. This symbolizes Mary's royal glory, and it shows her part in our salvation (in a way, it reflects the doctrine of Mary as Co-Redemptrix and Mediatrix of All Graces). Agiosortissa (Αγιοσορτισσα), Intercessor: Mary is shown alone, in profile, holding out her hands in prayer and supplication for us. She is facing to her left, where there is usually placed a separate icon of Christ. Oranta (Οραντα), Praying (also Panagia (Παναγια), Lady of the Sign): Mary is showing facing the viewer with her arms raised in the "orante" position (the same position the priest uses often throughout the Mass when praying, during the Collect, for instance), while the Christ Child is shown enclosed in her womb. There is much more I could say about icons of the Theotokos, but this is a primer on them. I hope that I will continue this series of posts with more frequency than I have done in the past. Until then, I hope you found this post helpful. God Bless. All-holy, immaculate, most blessed and glorified Lady, the Theotokos and Ever-Virgin Mary, pray for us! Nota Bene: I obtained the majority of the information for this post from Orthodox wiki, specifically the page on Icons of the Theotokos. The ending title of Mary was taken from its page on Theotokos. I apologize if any of the Greek is incorrectly transliterated in this post.